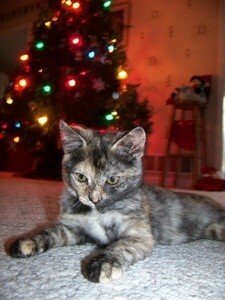 Tootsie is a 4 month old Tortie Cat. I heard a constant "mew mew mew" and couldn't help but follow the cries to see where it was coming from. I think she was about a month old when I found her in a cold parking lot hiding under a car. She had the biggest meow for such a tiny kitten. Every time I reached for her, she would back up behind the tire. So I began to imitate the call of a momma cat. She then ran out looking around. I picked her up. She purred so loudly and I had to take her home. Now she is spoiled and loves to annoy our older cats. She loves to curl up on blankets or pillows like its her own little nest. Right now she loves to knock ornaments off the tree. Tootsie is adorable. Thank goodness that you rescued her. She probably wouldn't have made it. Thank God for people like you who would rescue a poor defenseless cat. This story warms my heart. Sure happy you took Tootsie in. Bless you. She is just too delicious! Precious. I bet she rules the roost! You are a very kind person to take her in. You rule in the feline world Amber!